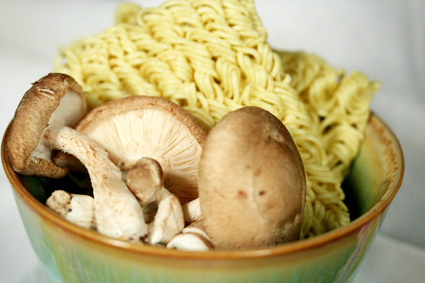 Curly, flavorful, creamy, and warm, I don’t know anyone who doesn’t love ramen noodles. But I think we all sense that the varieties we ate in college – the ones with the little flavor packet – probably aren’t the best for our health. But why? Basically, those ramen noodles are white pasta with no veggies but about three times the salt we should have in one meal. For all those ramen noodle fans out there, don’t despair – I have the solution! Check out my healthy ramen noodle recipe on AOL this week. I love Ramen noodles, except I don’t use the seasoning packets. It’s just too much salt or sodium. Instead I add my own healthy recipes. Veggies, whole meats, and healthy oils and some butter makes it great.